Considering that Beef Bulalo just edged out Sinigang na Baboy on my most recent poll (a surprise, as Sinigang na Baboy was a home run winner in a previous soup poll) as the reader favorite, I thought a few mouthwatering photos of bulalo would be appreciated. Boiled for hours in large cauldrons or pots, this soup has an intense beefy flavor. I suspect there are some beef bouillon cubes involved, but I could be wrong. The batch we got was delicious, a little salty, but really good. With the sweetness of corn added to the flavors of beef, leeks, etc., it was incredibly satisfying. 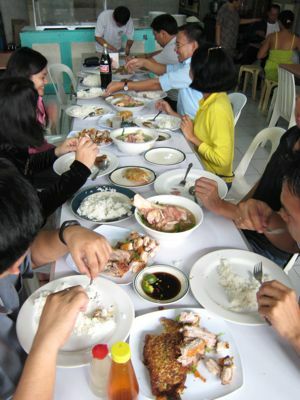 And at PHP300 an order which could easily feed 3-4 people, an incredible bargain, if you ask me! Three orders equals four bowls like those in the photo above. And you can keep asking for more broth/soup if you desire! The lechon kawali was fabulous, except for my pet peeve that it had been sitiing out for perhaps 30 minutes before we ordered it. I like it straight off the oil, but this was a turo-turo, after all. We had 3 orders of this… crisp, salty, fatty, flavorful… and perfect with some spicy vinegar and toyo and chilli… ah, cholesterol be damned! The plump eggplant looked better than it tasted. I so wanted this to be a homerun, but it had a lot of meat and possibly other fillers and while good, I didn’t think it was spectacular. Slather it with some banana ketchup, the only kind they had, and you had competent carinderia fare. And judging from the speed of consumption and lack of conversation, our table was definitely enjoying this mini-feast. We also ordered a few rellenong alimasag but those I would avoid the next time I visit… Not pleasant. There must have been enough soup for 150-200 orders that day, and they have been doing this for 34 plus years. 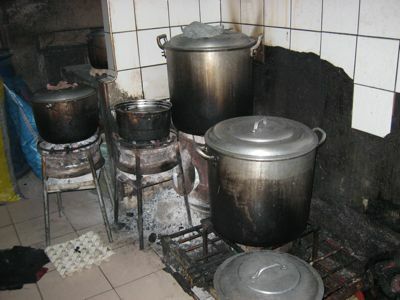 So after 30,000+ calderos worth of soup, you can imagine they have a brilliant recipe down pat! I didn’t even ask for the details, this is definitely a family heirloom… I was just grateful they allowed me to take photos in the kitchen! First callos, now bulalo…two of my favorites…the pictures literally made me drool on the keyboard ! I guess the ventilation in that kitchen is good enough that no one’s gotten carbon monoxide poisonning (that’s a lot of charcoal in an enclosed place). Wow, that bulalo looks good! Sure beats the bulalo that I had at a roadside eatery in Batangas. Callos, Bulalo!!!! Perfect indeed, for a weekend fare! yea, i’ve been there.and it’s the best pochero/bulalo i’ve ever tasted.. no. 1 for me. We’ve been eating here for 10 years already! 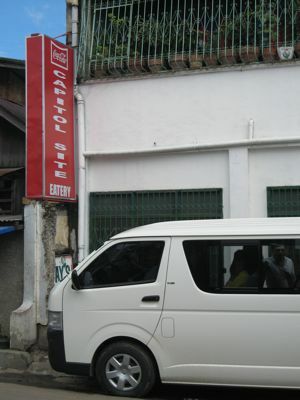 My family discovered it upon the recommendation of a taxi driver during our first trip to Cebu. We usually take the 10AM/9AM flight so that we could eat there just in time for lunch. :) Marjo’s is Cebu’s best kept secret! MM, Upon the family driver’s recommendation, my wife also found this “hole-in-the-wall” eatery a couple of years back. Just like Tasha, leave it to the drivers to know “the best kept secret places” in town. I Love Marjo’s!! we used to frequent this place a lot since it was my dad’s favorite restaurant. The lechon kawali is a must! you can actually request them to cook a fresh one, but it takes a while =) Pit Senor MM! The last time I was in Cebu for a lecture, I asked the med reps to surprise me with simple, super-delicious meal but not the “sutokil” type. They took me to this site and it was just utter cholesterol heaven!! I had to ask for statin samples to bring my levels down! SARAP Grabe!! My goshhhhh!!!! My favourite soup!!! I love, love loveeee bulalo!! and when i cook it, i add lots of marrow bone…hehe..i know its an artery clogger but it’s not the same without it =) i add lots of whole black peppercorns on mine cos i love that ‘maanghang’ feel in my mouth..with the melbourne weather going psycho at the moment…it’s supposed to be summer but it’s more like winter!??!! 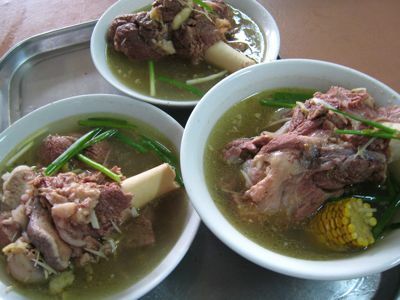 bulalo is the perfect soup to warm one’s body..
That’s our favorite Bulalo Joint here in Cebu. I have brought a lot of guests from Manila to this eatery and they have been coming back even without me. Its delicious and the price is so GOOD! Cebu-price gyud! I could not believe that you featured Manang’s Eatery in your blog. But you did and the pictures showed it. Im sure Manang will get lots of additional diners from your review. We also bring an empty casserole/pot whenever we will order a take-out bulalo. But MM, here in Cebu, they do not call it Bulalo but rather POCHERO. When I first came to live here with my family and first time I ordered BUlalo from Manang’s, I asked for BULALO but they corrected me and said “IT is POCHERO not Bulalo”. But I knew that Pochero is different from Bulalo but still Manang insisted that it is POCHERO and not BULALO. Maybe the lack of ventilation in the kitchen has made the staff loupy,,, a big exhaust fan would help. this is the kind of post that keep me coming back MM. and the callos post. and palawan and all your philippine travel posts. keep it up! Bulalo or beef nilaga with corn is definitely a winner! They look so yummy in the picture! I lived in Cebu for over a year handling several corporate acqusitions. I have had many many good meals in Marjo’s thanks for bringing back the memories. Marjo’s was always the sober option for puchero (as the cebuanos call bulalo) as compared to Abuhan for the late night inebriated option. I wonder if you ever ate in Kinamot sa Escario in my opinion that was the best restaurant to bring visitors to for a sampling of Cebuano home cooking.This restaurant had the best Balbacua. aside from the certain taste it gives, charcoal is very economical to use. imagine how much gas or electricity would be consumed to come up with such… yeah i remember they call bulalo- pochero,i remember sampling a sizzling pochero when we were in cebu last year,it was quite good too. i think you can achieve the charcoal effect by using a slow cooker. it does take forever though. i have roasted and simmered bones for 18 hours using industrial strength equipment (which made it feasible) but i have never achieved the beefy taste of a bulalo/balbacua stock until i read anthony bourdain’s kitchen confidential. he wrote about using minors beef base at the cia to have the best tasting stock in his class. nowadays, i don’t think twice about using those boullion cubes anymore. in Cebu, they call their Bulalo as “Pochero”. i haven’t tried Capitol Site but i’ve tried Abuhan. they also serve one mean “Pochero” in both soup and sizzling. i love Cebu. the food is just fantastic. you say bulalo, i say pochero. let’s call the whole thing off- they’re both certifiably yummy. marjo’s rocks! Maayong adlaw sa tanan!…….I lived in Cebu for 30plus years before we migrated to Canada. Marjo’s Pocherohan in Capitol Site is an institution in Cebu. On weekdays its hard to get tables since office workers and field workers too, are lining up for these “lami kaayo nga Pochero sa Marjo’s”. I will be there soon in Cebu to escape the very cold winter here in Canada. how about a great bulalo place in Manila, MM? I know…I know…you would tell me it’s better to cook it homestyle, but there are those “you know” times. thanks. Just wondering: how come the meat has a reddish tinge? Did they put in a ham bone for flavor? Amazing. we were talking about Marjo’s last Saturday.. Weird, crazy…. I need a lechon kawali capsule.. I don’t think I have ever tried this dish but it sounds very much like one of our Sunday dinners growing up. Except we called it Pochero and the veggies used were typically cabbage & pechay. It also had plenty of saba and Spanish chorizo for added flavor. I think it also had garbanzos but I hate garbanzos so I probably picked them all out. I don’t remember what cut of beef was used but whatever it was, it was yummioso! It’s always been one of my faves. I cook it now and again using oxtails and marrow bones both of which are really fatty so I usually chill the pot until the fat solidifies on top making it a breeze to pick out. Hmmm, now I’m thinking it’s time to make it soon – like maybe tomorrow? Lechonero, for dishes like this, a slow cooker just doesn’t produce the same depth of flavor that long, slow simmering does. Because food doesn’t come up to a rolling boil or even to a simmer, the flavors from say bones, are never completely extracted. Best you can do is to cook food conventionally until half done and then finish them off in the crockpot. I forgot to add in a previous post that adding a small amount of vinegar to dishes that call for boiling bony cuts will provide maximum flavor extraction. I read this from somewhere eons ago. Everything devilishly looking good! The bulalo and lechon kawali caught me. Whatever they do they do well to fill in what I would consider a large order 150 to 200 is really a taxing job. Lechonero: I would assume that you go to school MOn-Fri. Do you work on weeK-ends? If you don’t and have the time, maybe you might want to consider making this on a week-end, have a BULALO party (just kidding!) …make a really huge pot of this comfort food and FREEZE!…so anytime, you want something that would hit the spot as they say, it’s right at your fingertips…GOOD LUCK! …and if it’s not you, naku, sorry po! soups over charcoal IS best! 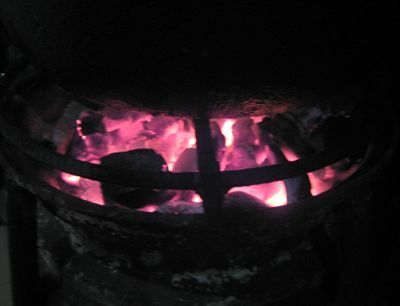 any beef or pork soup we cook here at home is simmered over hot charcoals all afternoon! we get a (white) creamy, smokey, beautiful stock by evening! saves on gas too! i miss the bulalo from this carinderia we go to in tagaytay! just thinking about it makes my tummy growl! kayenne et al, I have to try this soup over charcoal thing… dhayL, heehee, no I usually take the pictures and rarely come out in them… that guy is one of my colleagues at the office and is probably just smiling with glee at the feast that has arrived… and it was regular coke, no diet smayet coke in this joint! Hi MM. 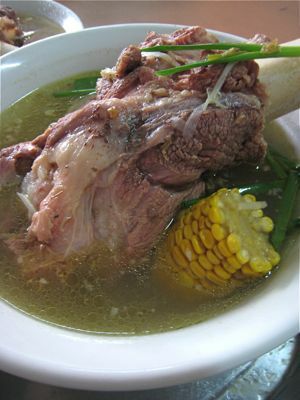 Cebuanos have their bulalo with corn. 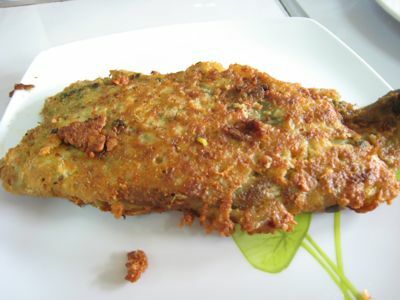 We Ilonggos have our more popular linaga, although the equivalent of the bulalo really is the kansi. Kansi is more popular in Bacolod. I wonder if you’ve been to Legaspi and tried eating the bulalo at hidden houserestos near the pier, I think. Its like you’ve never expect to find bulalo and alimangos awaiting you after walking along circuitous alleys of this area. Well, I’m a Cebuano myself. Lived here all my life but I’ve never heard of that place. I’m curious enough to want to try it unfortunately it’s already 8:30pm. I’ll have to save it for another day. Yum. I could never duplicate that long-simmered savory goodness of pochero/bulalao. Then one day, at the neighborhood taqueria, I passed up my usual order of crispy tacos, for a steaming bowl of soup that looked just like your pictures …with spring onions, corn cobs and a large meaty beef shank. What was it called? 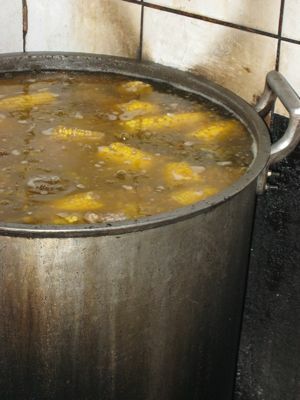 Caldo de Res, and along with pozole, and sopa de pollo, is the favored hangover fix in Mexico. Did it happen to come ashore on a galleon? Maybe, and it sure tasted like the Batangas version I had on one of my trips home. So all you homesick people on the West Coast of the U.S….head to your nearest taqueria! Nakaka-inis, naalala ko tuloy yung itinapon kong beef ribs and neck bones, kasi naiwan ko sa ref and was not able to cook it (I was sick), eh nasira. I was even going to cook it as nilaga with cabbage, potatoes and green beans. Seeing your pics, nanghinayang talaga ako. I do have some pork ribs right now, baka yon na lang ang gamitin ko. if your here in the states , how can i cook bulalo, i mean what kind of beef would I buy, coz I haven’t seen any meat with big bones like that in my supermarket. the picture made my stomach groan! i just want to run to the store and mke some!The ony thing i could think of would be oxtails, which I use for karekare. What do you think ? It’s just the beef shank, unchopped, the kind that’s used for osso buco. Same cut. Failing that, get beef ribs. 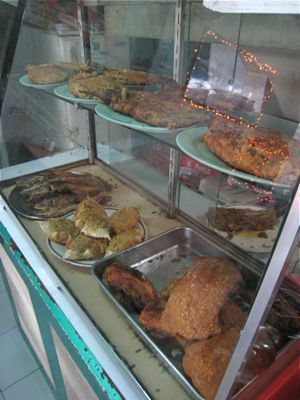 Happy to hear that Marjo’s still the favorite place to eat Puchero in Cebu. I have lived in Cebu for 15 years before moving to Vancouver 10 years ago, I remember there were only 2 places we hit when we want puchero, Marjo’s and Kan Irag hotel. (I don’t know it that hotel is still in business though). I think Cebuanos and the rest of Bisaya-speaking denizens in Visayas and Mindanao regions call it “Pochero”. When I came to Manila for University, I was surprised to know Bulalo tasted like Pochero (just as how I got so shocked few years back to know that Kangkong can actually be eaten by humans! Don’t get me wrong…it’s one of my favourite vegetables now. 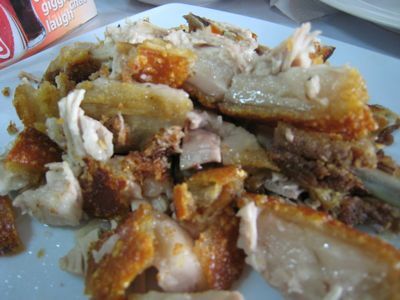 It’s just that from where I grew up (Dipolog City), it was popular as kaning-baboy. And it’s just recently that Sinigang was included, though scarcely, to our local menu. Anyway, my Lolo was a cook in Cebu before he migrated to Dipolog, the Spanish sardines capital of the Philippines. There, Pochero and Balbacua top the list of favourites. My Mama cooks really good Pochero though I hated it when I had to wait “that” long. Also, I think experimenting with food (mix and match of taste) is a true chef act. So maybe, when I come home this summer, I’ll throw in some fresh greek oregano when Mama isn’t looking. nakita ko po sa internet ung bulalo nyo nakakagutom talaga at ang sarap kahit sa internet ko lang nakita. Gusto ko pong magtayo ng bulaloan at gusto ko rin malaman kng paano simulan at ano ang mga sekreto sa pagluluto? magkano din po ang paunang kapital para makapagsimula? salamat po!! JUn. My best friend visited me from dubai and i wanted to show him the filipino restaurant in qatar,first i bring him in a place called “FILIPINO SOUK” where concentration of filipino people and products are flourishing.Unfortunately,all restaurants in the vicinity are closed as it was friday,then i started to think if where else in doha i could find a filipino restaurant? Suddenly we drived to al sadd area where i remember a restaurant having a lightly lit signboard”oriental” something like that.The interior is professionaly decorated in simple way thought its tight.upon reaching the counter, a photo of steaming bulalo is just right thru the face. then i just ordered that as it looks ok. waiting for half an hour then it was served hot and steaming, a big bowl of bulalo and bangus na sinigang with rice(we actually made mistake in ordering both soupy food)My GOD! that bulalo is really very much delicious! the soup is too different from any bulalo i tasted before. we even did not touched the sinigang na bangus in process. The way they cook is done intricately and perhaps planned accordingly. we finish the big bowl to the bottom, Definitely im going back to that restaurant this week end and let me ask if they will allow me to know their secret recipes(if there is)…. The Hungry Hound Pub & Kitchen – Sneak Peek!